IPU Result 2019: Indraprastha University Common Entrance Test Result, IPU CET Result in short, for 2019 will be announced by the Guru Govind Singh Indraprastha University (GGSIPU) in the month of May and June. IPU CET Exam will be conducted in the month of April and May 2019. IPU CET is conducted for different courses and you can check the exam dates and IPU Result declaration dates for all the courses below. The IPU result will be released in the online mode within two weeks after the exam is conducted. Candidates can check out their IPU result on the official website of the University: ipu.ac.in by entering their Roll Number and Programme Code. After the declaration of IPU result, a merit list will be prepared based on the IPU CET 2019 Cutoff. If your name is in the merit list then you need to appear for the IPU CET Counselling 2019. The counselling will be held on the main campuses and will be conducted from the month of June 2019. *Please note that these are tentative dates. Once the official IPU CET notification is out, we will update them. Candidates can check their IPU result once it is released on the official website. The IPU result will be available only in the online mode. Candidates need to follow the steps mentioned below to download their IPU scorecard. IPU results are declared separately for each course. A merit list will be prepared where the names of the qualified candidates will be written. 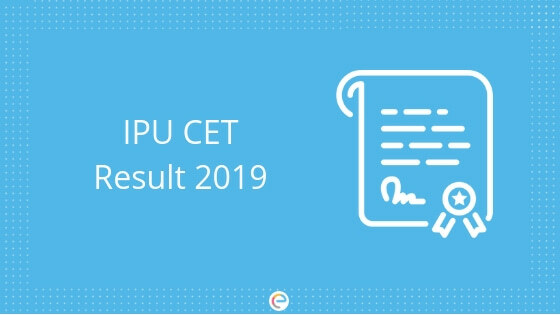 Click on the link provided to check the result of IPU CET 2019. Enter the CET 2019 Roll Number and CET Code of the course. Verify the details and click on the “Submit” button. 3. Candidate older in age will be provided a higher rank. Submission of Counselling Fees: The counselling fees can be paid in both online and offline mode. Payment of Rs 1000 (which is non-refundable) will have to be made. To complete registration for counselling, candidates are required to enter Roll Number, Date of Birth and Mobile Number. They need to go to the “Payment of Counselling Participation Fees” tab where they need to enter the required details to pay the participation fees. For offline payment, candidates need to deposit challan in IPU Bank account. Registration and Choice Filling: After the submission of application fees, candidates need to visit the official website and register for IPU CET 2019 Counselling. Candidates are required to fill up their choice of college and branch (if applicable). Allocation of Seats: Seat allotment is done purely on the basis of merit, category, and availability of seats. After the seat allotment, Rs 40,000 is to be paid as academic fees. If you are preparing for IPU CET for admission to B.Tech courses then you can use Embibe to solve JEE practice questions and JEE mock tests. The syllabus of IPU CET 2019 is almost the same as the syllabus of JEE Main. So, these resources will help you in your preparation for IPU CET as well as other engineering exams all over India. We hope this detailed article on IPU Result helps you. If you have any doubt regarding IPU Result then you can post your questions in the comment section below. We will try to answer your query as soon as possible.